Manual changeover switch are mostly use in 2 types , in which one have the move able knob and 2nd one the handle changeover switch. This post i will shown the complete method of manual or handle change over switch , the knob type manual changeover switch wiring same like handle change over switch and it's just like a voltmeter sector switch. 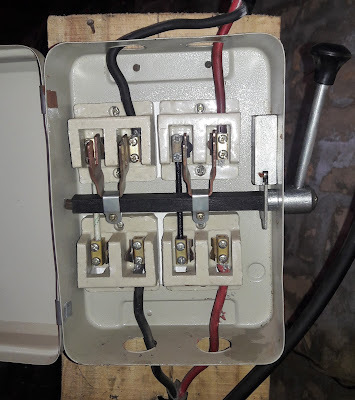 Last day i am doing some new electrical instillation, and i saw the handle type manual changeover switch, and get a photo for you, which help you in understanding the connection. Note this post is only about handle type manual changeover switch wiring diagram , however the knob type changeover connection is also same. There are 3 types of changeover switches which we use for generator and main supply or we can also use the changeover switches for two supplies. 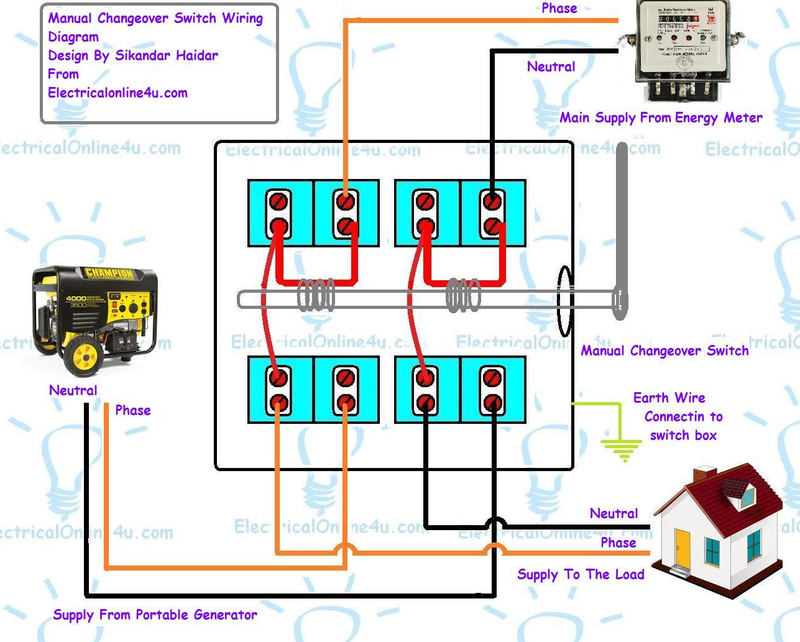 In this post i am explaining the type one , Below i shown the single phase manual changeover switch with image and connection & manual changeover switch wiring diagram with complete connection of main supply and generator supply and out going supply to the load. In the above manual changeover switch wiring diagram , i shown the incoming supply from the energy meter, incoming supply form the portable generator , and out going supply to load or house load. In the diagram i shown handle type manual changeover switch. in which i done all the connection. On thing more always do earthing connection to the changeover body , if you have the earth wire. This connection can also work with out the earth or ground connection, But in Electrical Works the most important thing is safety so always do ground connection. In the above diagram the black color denote the neutral wire , red color denote the phase wire (Line / Hot wire) and Green color denote the earth / ground wire. After this diagram i hope now you will be able to connect a portable generator to house load. here i have an image of handle type manual changeover switch which capture with my mobile camera. In the above manual changeover switch / transfer switch image, the connection is not done, and not a proper method of installation and wiring, however i capture this image just for you to see the manual changeover switch / transfer switch internally. 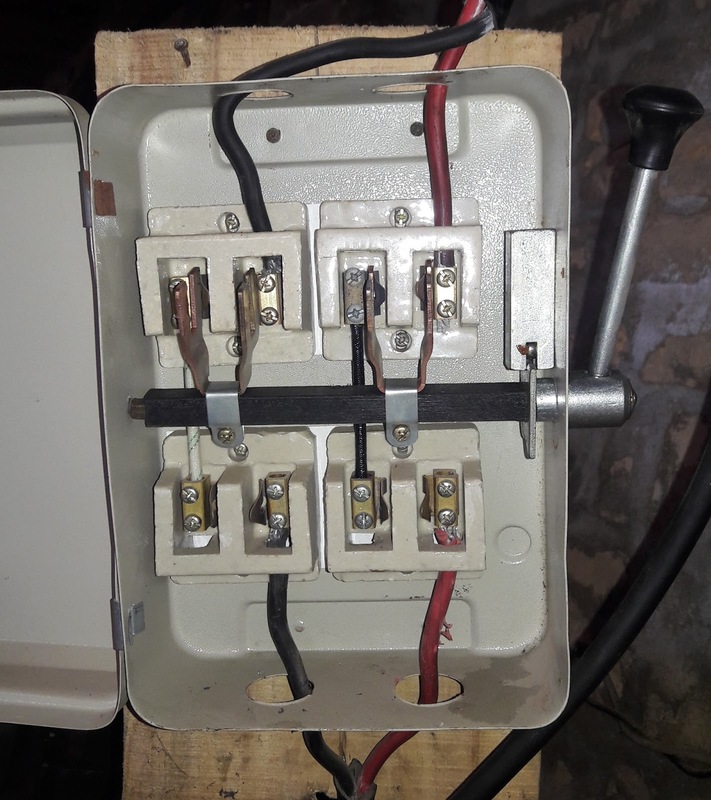 I hope after the above image and manual changeover switch wiring diagram, now you will be able to connect a portable generator to your house wiring. IN SHAA ALLAH soon i will make a diagram about connection of portable generator to distribution board or how to connect your portable generator to your distribution board. impressive and satisfying. helps a lot of electricians.